If you live in a small apartment or dorm room, or simply don’t want to deal with the hassle of getting a tree, you can channel Christmas spirit in your home without any pine needles. There’s no more recognizable symbol of Christmas then the ever-lovin’ tree. I know that when I was growing up, we always put up the tree the day after Thanksgiving. It was a huge tradition that the whole family got involved in. It was very important that I find my Hello Kitty ornament and hang it myself (I’ve had it since birth). Do you have any memories like that? As a result, the Christmas tree is very special to me – I love it as a decoration, not just as the tree with the ornaments itself. A set of crafty trees that represents me (and is easy to make) are these whimsical circle trees. I can’t wait to make them! 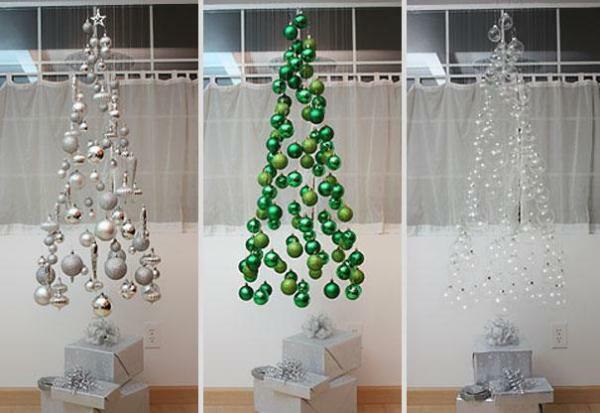 Would you like some DIY Christmas tree ideas? More to come after the jump!